Mina Kousathana (one of the twins) has always seen fitness and gymnastics as means for ingesting the sense of love and hospitality through body movements done by her students. That derives from her childhood, growing up in mykonos island and the values her parents gave her as a heritage. She wanted all the energy which derives throughtout the body to be channelled properly for the wellbeing of her students, as the greek “philoxenia” or hospitality and warmth is a balsam for the traveller. Within that feeling Mina manages throught her dance courses for her student to feel the energy and power derived from the exercised body, as the joy and the excitement a traveller fells when he is welcomed and greeted with smile and warmth throughout his vacation. Mina holds a bachelor degree in modern dance and ballet from SouthEastern college of Athens just as her twin sister. She has an inclination towards ballet and the exercises involved due to harmony and wellness they bring to the student. Delos is a big love of Mina and an inspiration for her due to its close location to ornos bay and the neighbouring bay of agiannis. It is one of the reasons she follows a vegetarian diet since 1990, the one diet that she believes is the most efficient for the energy flow inside the body. Her love to all kind of life within this creation and her tendecy for a holistic body wellness, mainly because exercise and fitness are embeded in her DNA has lead her to avoid consuming animal products. This is a reason why twins apartments mykonos are vegetarian and vegan friendly, as the hostess follows that kind of lifestyle for years now. 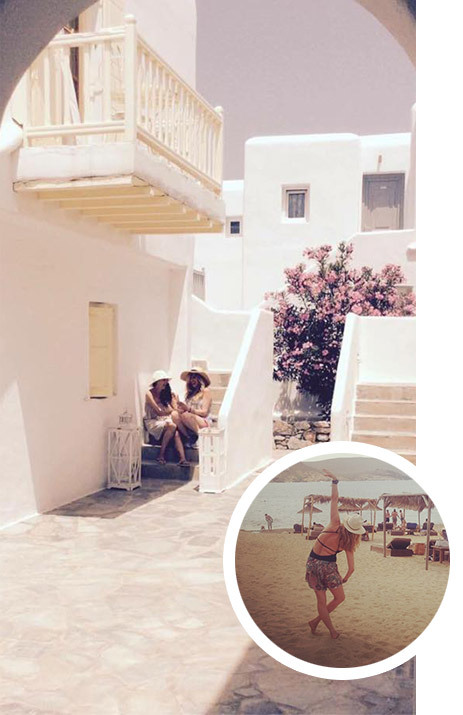 Since 2001 Mina along with her twin sister Trisa restored and renovated the studios for rent in ornos, mykonos, as originally built by their mother and are involved hosting guests around the globe from April to October every year. Mina never stops thinking ways of providing high value services to her customers, matching a vacation, with dance classes, yoga classes, gymnastics and ballet courses an the traditional myconian philoxenia into a spectacular experience for the traveller who will choose twins mykonos studios for rent for his stay.